Make sure the speaker is fully charged using the USB charging cord supplied with the speaker. Twist open the speaker to access the charging port inside. After charging the speaker, slide switch to "ON". Twist back the top lid to close the speaker shut. Push down the button on the far right side of the speaker exterior until it flashes red/blue multiple times. The speaker should now be discoverable by your music player. Configure settings on your music player device so that Bluetooth is turned on. 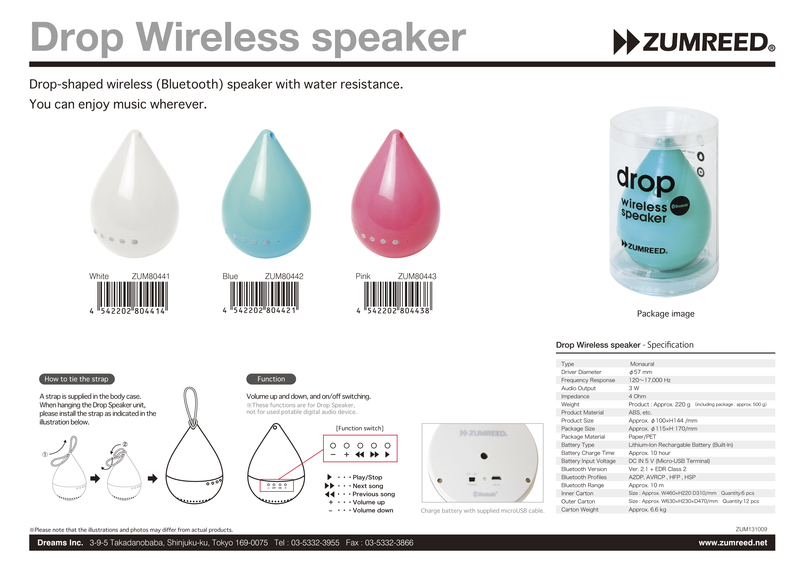 Find Drop Speaker on the list of available devices and select it to connect to the speaker. to protect against from water and sand. Designed by Dreams in TOKYO　© 2013 Dreams Inc.